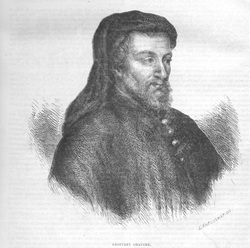 Poet Geoffrey Chaucer was born circa 1340 in London, England. In 1357 he became a public servant to Countess Elizabeth of Ulster. He continued to work as a public servant to the British court throughout his lifetime. The Canterbury Tales became his best known and most acclaimed work. He died October 25, 1400 of in London, England and was the first to be buried in Westminster Abbey’s Poet’s Corner.